How will atheism fill the huge void it will create when it replaces theism? I find so much to wonder at in the natural world and universe that, for me, the question never arose. When I realised that I simply did not believe any of the BS my main feeling was one of relief. I hadn't realised just how much of a burden trying to twist my mind to accept things that are patently absurd until I lifted the burden. How this might work for people who like to have all their answers already answered for them, no thought required, I have no idea. I suspect that what will eventually happen is that religion will gradually fade away. Today, more and more of the young people are leaving religion behind. The time will come when the last believer dies and finally the world will be free from the vicious yolk of magical thinking. Well, doubt that we will be around when that era dawns! But I sort of go with Bluenose, education in the natural beauty of the Universe (including humans of course) - plus an understanding that it also contains death and destruction, some of which is unavoidable but a lot of which is by our own agency and therefore, possibly, avoidable. I am going to suggest that humanism will gain members but they may be "nominal", not consciously "practicing" but, sort of, following a set of rules that their education offers them about citizenship and ethics. I hope. But then, could be just a human generated apocalypse? Is there going to be an overnight revolution, yesterday religion today rationalism? Atheism isn't really an "ism"
I don't think rationalism serves as an opiate, maybe they'll just switch to opiates. Anyway, whatever, people need their medication. If theism passes atheism/rationalism will pick up a percentage but most will just take up with some other nonsense, maybe-perhaps-what-doIknow. It's not as if religion is a large part of the nominally religious persons life anyway. I think the question is dodgy and I expect there is a name for its particular kind of dodgy but so far I haven't bothered getting the labels straight. I know dodgy when I see it though. As long as there are humans inhabiting this pale bite dot Tank, rationalism will never replace irrationality. I agree. But it doesn't have to be total or absolute to be infinitely better. 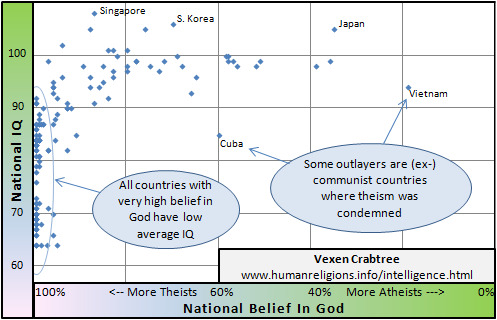 Somewhere , maybe on HAF, I came across an assessment of which country was the least religious. At the top of the list....as I recall (or not recall) the least religious was the Czeck republic???? Maybe it was Hungary. The demise of religion is a slow process here in the US. I live across the street from a very large, opulent and well kept Baptist church whose attendance has been declining for several years. The church has now been closed and the facilities will be used for a school. I suspect that the school is a faith based one. Across town there is a magnificent old Presbyterian church that has held forth for nigh on 100 years. It is now closed because of declining attendance. I have mixed emotions about those developments. I have almost zero tolerance for the narrow minded pronouncements of the Jesus people but I also have some compassion for them. That their churches are failing is a sad time for them . As much as I am opposed to the general insistent teaching of the churches, I do have some compassion for the members who have lost their spiritual anchor. Then there are the mega churches like the one in Houston, operated by a man who I believe is a shameless charlatan, Joel O'steen. His church has weekly attendance in the tens of thousands. The traffic congestion caused by the attendees, and the necessary regulation thereof by the police force is a costly proposition. Never the less it is an expense absorbed by the tax payers, most of whom have no connection to that church. I reckon that it will be a thousand years before our general population has dislodged themselves from the religions that are so dear to them. The part that concerns me most is that the least educated of the populace will be the last ones to go. "Replace" implies it has a competing set of ideas/values/whatever. I view it more as the vacuum that is created when belief in a god is removed. In that way it's not truly a replacement. If suddenly all belief in god and all religions were gone, that wouldn't imply any coordinated school of thought or belief that replaces it. It also doesn't necessarily mean a rise in intelligence. To truly replace theism, you'd need a set of core values and beliefs, and the desire to spread them to others. So... a religion of atheism? Good ponts, Joe. But this is where I think humanism, or something like it could fill the void, without the prescriptive or dogmatic elements. There are obvious differences as to how humanists/atheists and theists view the natural world and the origins of morals and ethics, but humanists, unlike pure atheists (so far as I know), voluntarily subscribe to a set of "rules" that imply a duty to humanity and were actually agreed internationally. This makes humanism a kind of "belief". Those who have thought enough about what they do and do not believe in to consciously declare as atheists have almost certainly adopted a personally worked out version of those "rules". This is as opposed to the "I don't believe in nothing" brigade and the, "I just wanna do my own thing without this god stuff" types. There are no supernatural beings. The material universe is the only thing that exists. Science provides the only reliable source of knowledge about this universe. We only live this life - there is no after-life, and no such thing as reincarnation. Human beings can live ethical and fulfilling lives without religious beliefs. Human beings derive their moral code from the lessons of history, personal experience, and thought. I doubt that few here wiuld have much argument with that but, perhaps, do not wish to subscribe to the "humanist" label. But it doesn't have to be total or absolute to be infinitely better. Point taken. However, humankind has a dire desire to be loved. That, coupled with their grotesque, delusional, over valued self worth, essentially assures a wish granting sky daddy remains an element of the human ethos for the foreseeable future. I think you are right. The initial aim should be to separate mythology from politics and give evidence based research a bigger voice in decision making. Some years ago, along with about 600 others, I sent a copy of a book on using science in decision making (written specially for this purpose) to my MP. Never got an acknowledgement. It never got mentioned in the press that I noticed then. Later: the book, by Mark Henderson, was called "The Geek Manifesto" and I eventually found this interesting site. Seems there has been a recent similar scheme to educate our MPs about legal matters. Did the same thing with The God Delusion some years ago. Again no acknowledgement of receipt.